When you are learning how to make green bean recipes you will have many different varieties and types to chose from. There are different types of green beans numbering well over a hundred. All these different beans are classified into two basic growing groups; the bush type and the pole type or climbing beans. Since the pods which hold the beans are edible, these beans are bred for the flavor and texture of the pods as well as the inside beans. When you are learning how to make green bean recipes a certain type will be specified to use; in the famous holiday casserole with mushrooms it is the French style. These are long and thin beans. When you purchase them canned or frozen, they are usually also sliced lengthwise. This design enables the flavor of the mushrooms and onions to be absorbed in the beans which is why this is a favorite recipe. When you have learned how to make green bean recipes you will find some of the oldest recipes were made with the string bean; these have been around for centuries. They are called “string” because a string runs the length of the bean and must be removed before cooking. One must learn the knack of removing these strings but once conquered this type of bean has the most delicious flavor. If the strings are not completely removed they are very annoying to eat. Most green bean recipes use the stringless variety or can be made with any type you prefer. The stringless beans were developed at the end of the eighteen hundreds for all those who hated dealing with the “strings”. They have become very popular and are the most widely grown. The people loyal to the string beans say there is no comparison in taste; the “strings” win out. 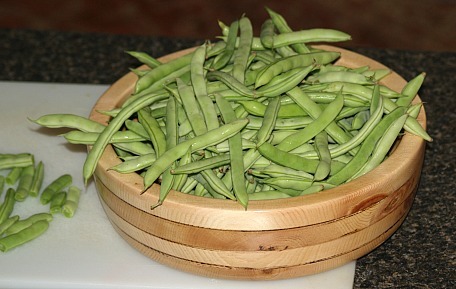 All green bean recipes can be steamed, boiled, baked in casseroles and used in stir fry dishes. More recently many restaurants have decided to bread the beans and deep fry them to serve as appetizers; these are delicious. My older sisters use to eat their home canned green beans when they went on a diet. They are very low in calories; contain no saturated fat and rich in dietary fiber. Now, that is the plain ones right from the jars; it is a different story in some of the green bean recipes with the high calorie creamy ingredients. Green beans also contain great levels of Vitamin A and antioxidants like lutein, zea zanthin and B carotene which help prevent aging and some diseases. Generally speaking beans supply large amounts of vitamins and minerals. There are many green bean recipes calling for a variety of ingredients to season them with. 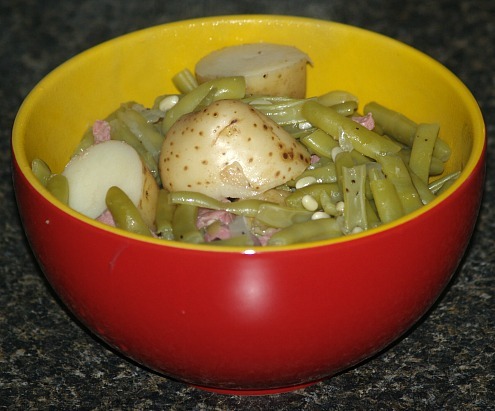 Some of my favorites are ham, bacon and garlic if learning how to cook green beans. This is one of the most popular vegetables for home gardeners and home canning. If you do not grow your own, you have a great selection when buying from the supermarkets; fresh, canned or frozen. 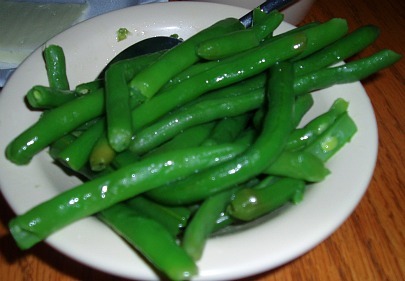 Green beans can be canned simply with water and salt. Follow the instructions with your canner or your favorite canning book. This recipe is different as the beans are flavored in the jar. Wash beans thoroughly, drain and cut into lengths to fit in pint jars. Pack beans into hot sterilized jars. Add the red pepper, mustard seed, dill seed and garlic. Combine the vinegar, water and salt; heat to boiling. Pour boiling liquid over the beans, filling the jars to within ½ inch of the top. Adjust jar lids. Process in boiling water bath for 5 minutes. Cook bacon in a large skillet until browned. Stir in the onion and cook until tender. Add the green beans, water, vinegar, bouillon cube and pepper. Bring to a boil and serve. Melt 1/3 of the butter in a saucepan; sauté onion until tender. Add flour, salt and pepper; add sour cream, blend and heat until warm. Pour into a greased casserole dish; top with broken cheese pieces. Melt remaining butter; stir bread cubes into the melted butter. Spread bread cubes and butter over top of the cheese. Bake for ten minutes or until cheese heats and melts. Drain all canned vegetables; mix together in a large bowl. Combine the sugar, vinegar, cinnamon, salt and pepper; pour over the vegetables. Wash and break beans in pieces; place in colander, wash again and set aside to drain. In large Dutch oven brown salt pork in bacon grease on medium heat turning often. 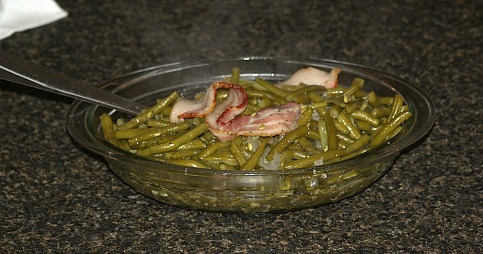 Toss green beans into Dutch oven stirring well to coat beans in bacon grease; add broth. Cover tightly and cook over medium low heat about 30 minutes until beans are half done. Add potatoes and onion to pot and if needed ¼ cup more of broth; cook until potatoes are tender. Remove lid, add butter, salt and pepper; with lid off cook 15 minutes longer. Note: Make sure pot has liquid so it doesn’t stick.